As with so many historic events in our nation’s great history, the tragic events that took place in our country on September 11, 2001, make it a day we shall never forget. On September 11, 2011, the Beverly Hills 9/11 Memorial Garden was unveiled. This awe-inspiring garden honors all those who were lost, those devoted to keeping America safe and those of us who still believe all are created equal and have the right to Life, Liberty and the Pursuit of Happiness. Contribute today to help create a meaningful place of remembrance, dedication and reflection in the Beverly Hills community. All donations are tax deductible, Federal Tax Id #26-4563945. 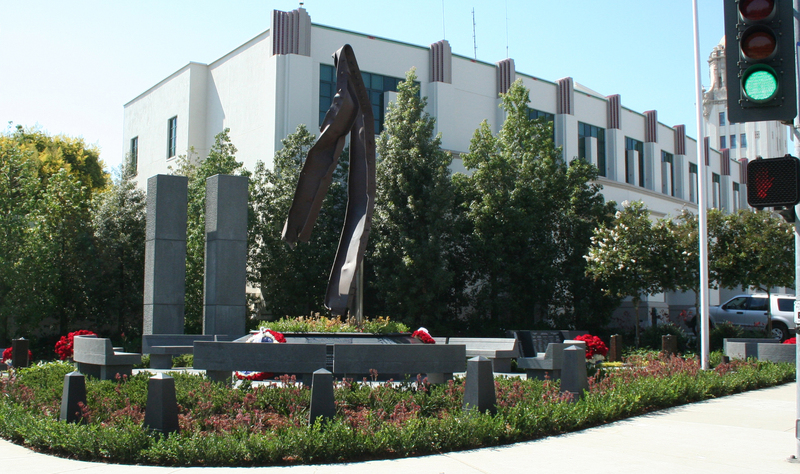 The Beverly Hills 9/11 Memorial Garden pays tribute to those whose lives were lost on 9/11 and serves as a constant reminder of the heroism exhibited by fire and law enforcement personnel and first responders. A volunteer group, the Beverly Hills 9/11 Memorial Committee, was established to oversee this project, fundraising efforts and community outreach. We are so grateful that you continue to host this event each year. My wife's youngest son lost his dad in 9/11, and since they moved to LA it has been difficult to find any memorials. We were deeply moved by your site and last year's ceremony, and plan to attend again next week. Thanks for all you do. Thank you again for the opportunity to participate and play taps for this wonderful event. It was indeed a pleasure and an honor. Thank you Beverly Hills for making this 9/11 Memorial accessible to all who want to visit it, in solemn remembrance of the day that Should "Never be Forgotten".